Provide comfort for the family of Dorothy Pullyblank with a meaningful gesture of sympathy. Dorothy Robertson Pullyblank predeceased by husband George R. Pullyblank, parents Henry and Mae Kime Robertson, sisters Virginia Robertson, Marion Friend, Eva Burson and brother William Robertson. Dorothy is survived by her children, Georgeann (Frank) Cappotelli of Frisco, Tx, Lynn R. Pullyblank of Leicester, Sheri (Michael) Backus of Mumford, Joan (Michael) Tucci of LeRoy; grandchildren Andrew Cappotelli, Aaron (Bridget) Cappotelli, Lynn Pullyblank Jr., Amanda (Jay) Borden, Gregory Backus (Roksolana) , Meghan (Eric) Palumbo, Sarah (Aaron) Hallett, Michael (Casey) Tucci, Amy Tucci, and Kaitlyn (Mauricio) Hilario. Dorothy also witnessed the blessing of great-grandchildren, Kate and Abby Cappotelli, Alexa and Ava Cappotelli, Jordyn and Aidan Pullyblank, Ashlee, Emma, Cloey, Grace and Isabella Borden, Ari and Andrew Palumbo, Lillian and Sadie (soon to arrive) Hallett, Nate Kozak , Kendall and Riley Tucci, Bryce and Braxton Hilario. Dorothy is also survived by sister-in-law: Marion Hillman, dear niece, Dorothy Schiessl and many nieces, nephews and grand nieces and nephews. Dorothy was born in Mumford, New York on April 16, 1918 and graduated from Caledonia High School. She attended Rochester School of Commerce. Dorothy married George Richard Pullyblank on August 19, 1944 and worked at Lapp Insulator in LeRoy before raising her family. She later worked at the Avon Nursing Home as an aide. After she left the nursing home she continued to work as an aide for several families in Mumford. Dorothy also served as Secretary/Treasurer of the Mumford Rural Cemetery well into her 80s. She helped to start the Mumford Youth Group that met on Thursday nights for the youth of Mumford. She was always interested in young people and believed as adults we needed to keep them busy and involved. 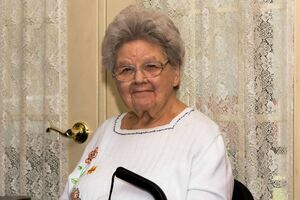 She served many years on the Wheatland Parks and Recreation. Dorothy was a lifetime member of the Mumford Ladies Auxiliary and member of the First United Presbyterian Church of Mumford. After raising her family and the passing of her husband, she pursued an interest in painting. In her 80s she began attending art classes at the Wheatland Senior Center and painting became a passion for her. Dorothy enjoyed the friendships she made with fellow-artists and teachers. Dorothy also loved to play euchre. At family gatherings she would always pull out the cards and share a good game with her children and grandchildren. She was happiest when she was sharing laughter with her children and grandchildren. She also loved watching the New York Yankees. During the spring, summer and early fall she never missed a good game of Yankee baseball. Dorothy lived life to the fullest and enjoyed every second of her 100+ years spent with her family and friends. There will be a private interment at the Mumford Rural Cemetery on March 24th. A memorial service will be held at 11 am on Saturday, April 13th at the First United Presbyterian Church, 893 George Street, Mumford, NY 14511. In lieu of flowers donations may be sent to the First United Presbyterian Church of Mumford or the Mumford Fire Department. The family wishes to thank the Village Green Nursing Home and their staff for the excellent care of their mother along with care givers Barb Hotz and Susie Sims. We also thank family, friends and neighbors for their kindness shown and visits to our mother while in the nursing home. I never met Dorothy but I loved the stories Georgeann shared about her mother. Remarkable women. My prayers for peace and comfort to the family during this difficult time.